Digital experience (DX) platforms like web content management systems are slowly but inevitably moving to the cloud because of its significant benefits, including faster deployment, always-current software, better support for mobile devices and ability to scale to hundreds or thousands of sites. Unfortunately, vendors make it hard to buy cloud solutions, partly because they casually drop terms like IaaS, PaaS and SaaS. But what do these terms mean, how are they different from each other, what are the benefits and, most importantly, why should you care? Forrester Research dives deeper into the three types of cloud solutions and articulates the benefits that come from each cloud model. In addition, Forrester explains what makes these solutions more compelling than legacy on-premise solutions. Forrester Research. 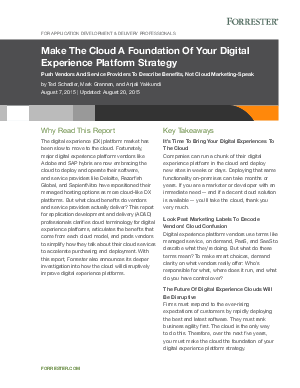 Make The Cloud A Foundation Of Your Digital Experience Platform Strategy. Ted Schadler, Mark Grannan and Anjali Yakkundi. Aug. 20, 2015.